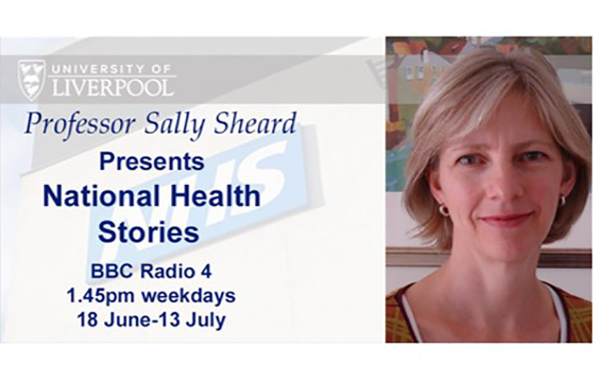 University of Liverpool Professor Sally Sheard’s 20 part BBC Radio 4 series on the history of the NHS begins today at 1.45pm. The provocative series features key moments in the history of the NHS, from the poor health care available prior to its introduction, to its difficult beginnings and key achievements and challenges. Working with BBC producer Beth Eastwood, Sally drew on historic audio archive material, including recordings of speeches given by its visionary founders, William Beveridge and Aneurin Bevan. Professor Sheard, an expert in public health and modern history in the University’s Institute of Psychology, Health and Society, said: “It’s been a huge privilege to write and present this series for BBC Radio 4, but I found it difficult to choose just twenty key stories to represent the NHS’s 70 years. “Some of the highlights for me were listening to the first patients to have kidney dialysis, and the hidden voices of patients in long-stay mental health institutions in the 1960s. “People think they know the NHS, but I hope this series will surprise them. “For example, the Treasury hindered health education campaigns publicising the link between smoking and lung cancer in the 1950s, because it needed the tobacco revenue to fund the NHS. Sally interviewed former leaders of the medical profession, healthcare pioneers and nurses who took on key management roles. A common theme through the twenty stories is the constant concern about funding – right from the start of the service in 1948. Several of the episodes focus on difficult decisions that were made about who to treat and how to pay for the NHS. Sally Sheard is the Andrew Geddes and John Rankin Professor of Modern History at the University of Liverpool. She has researched and published on health policy development and the role of expert advisers, and is currently leading a five year project funded by the Wellcome Trust, called The Governance of Health: medical, economic and managerial expertise in Britain since 1948. National Health Stories is on BBC Radio 4 each weekday at 13.45 from 18 June to 13 July. It is also available through the BBC iPlayer and as weekend omnibus editions.